LCD projectors employ a three-panel LCD (Liquid Crystal Display) system, referred to as 3LCD. LCD projectors crisply reproduce bright, naturally colored images that are easy on the eyes. LCD projectors are also capable of detailed shadow reproduction that is ideal for demanding business and home theater applications. The white light from the projector lamp is split into red, green, and blue components using two dichroic mirrors, special mirrors that only transmit light of a specified wavelength. Each red, green and blue beam then passes through a dedicated LCD panel made up of thousands of miniscule pixels. An electrical current turns the panel's pixels on or off to create the grayscale equivalent of that color channel. The three colors are then recombined in a prism and projected through the projector lens and onto the screen. By using a combination of three LCDs to produce a final image, LCD projectors are capable of billions of colors and smooth grayscale gradations. The resolution of the image is determined by the number of pixels in the LCD panels used. Currently LCD panels offer resolutions as high as true HD (1920 x 1080) for home theater applications. New panels promise resolutions as high as 4K (3840 x 2160). 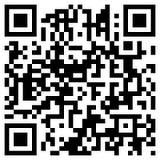 Digital Light Processing is a proprietary system developed by Texas Instruments, and works differently to LCD projection. 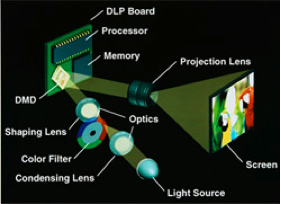 Most DLP projectors have a single chip instead of glass panels through which light is passed, and this chip has a reflective surface composed of thousands of tiny mirrors which correspond to individual pixels. These mirrors can move back and forth when light is beamed onto the chip to direct the light from individual pixels either towards the projector lens or away from it. In order to define colours, DLP projectors have a colour wheel that consists of red, green and blue filters. This wheel spins between the light source and the DLP chip and alternates the colour of the light hitting the chip between red, green and blue. The mirrors tilt away from or into the lens path depending on how much of each color is required for each pixel at any given moment. The various advantages and disadvantages of LCD and DLP projectors mean that each is suited to different applications. Lighter, less bulky DLP projectors are favored by presenters on the road. DLP projectors are also very popular with home theatre enthusiasts due to the higher colour saturation, better contrast and image stability. Entry level DLP home theater projectors are also very affordable. LCD projectors are often more affordable, making them attractive for education organizations. Their higher light output make them well suited for classrooms and larger conference facilities, as does their increased image sharpness which makes them good for displaying data-rich presentations such as spreadsheets and graphs. In terms of market share, LCD projection technology is currently leading DLP technology due to the larger number of projectors using the LCD system. Sony and Epson are the largest LCD manufacturers, along with Hitachi and Sanyo. Optoma, InFocus and BenQ, on the other hand, use DLP technology.